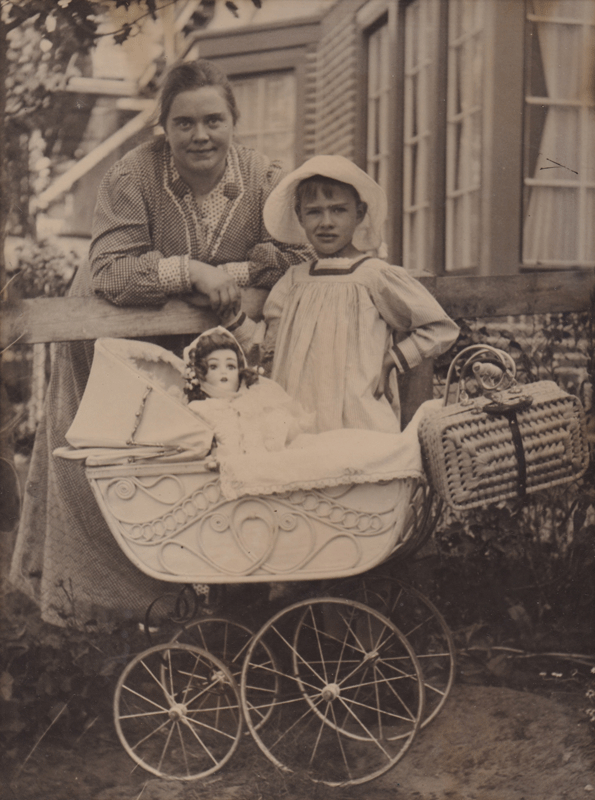 Berendina Johanna Hubscher (nicknamed Moeke, Dien, Dientje and Oomoezie) was born on 28 October 1878 in Oldenzaal, Netherlands. On 20 March 1903, she married Nicolaas Urban in Almelo, Netherlands. From this marriage were born three sons, all of whom died at a young age, and two daughters, Marijke (1905) who married Theodore Pitcairn in 1926, and Charlotte (1915) nicknamed Lotty. The family lived in Amsterdam, Bussum, Hilversum, Amsterdam and finally in Blaricum/Laren1, before purchasing a house in Recloses (Seine-et-Marne, France) in 1926 where they stayed frequently. After divorcing Urban in July 1929, Berendina lived with Philippe Smit, who had bought the Chateau de la Motte in Thoury-Ferrottes in 1926. The couple married in Pau in 1940. Berendina shared Smit’s Swedenborgian beliefs and became the subject of many of his paintings and portraits although not always without difficulty. Indeed, a letter from Nicolaas Urban to the Pitcairns in 1933 noted that Smit had been working on a portrait of Berendina, but that he “finds it very difficult to paint her nose“.2 Berendina’s nose had always been the object of much teasing in her family. Similarly, in 1928, Theodore Pitcairn urged his mother-in-law to have confidence in the talent of the painter to perfect her nose.2 Always very close to her son-in-law Theodore, Berendina was a strong woman who shrewdly negotiated the sales of Smit’s works to him. After Smit’s death in 1948 and the sale of Recloses five years later, she alternated between living in France and the US with her two daughters, with whom she shared the paintings she owned. Afflicted by blindness, she retired to Amsterdam after 1964 where she died in December 1969. 1. The Urbans’ villa “de Sparen” was located in the village of Blaricum, Achter Torenlaan, just on the border to Laren, the centre of the family’s and Philippe Smit’s social and cultural life. Theodore and Marijke Pitcairn baptized their eldest son Laren in memory of that town. The Urbans left Laren for France in 1926. 2. “[…] Philippe is bezig met een portret van Moeke [Berendina], en heeft een hevige worsteling met Moeke’s neus want die kan hij maar niet rond krijgen en glimt bovendien teveel. […]” (Philippe is working on a portrait of Moeke (Berendina) and finds it very difficult to paint her nose because it is round and too shiny.) (Nicolaas Urban, ALS to Theodore and Marijke Pitcairn, n.d. , private archives, Paris). 2. See [PS 298]. Berendina with her daughter Marijke, c. 1910-1912. 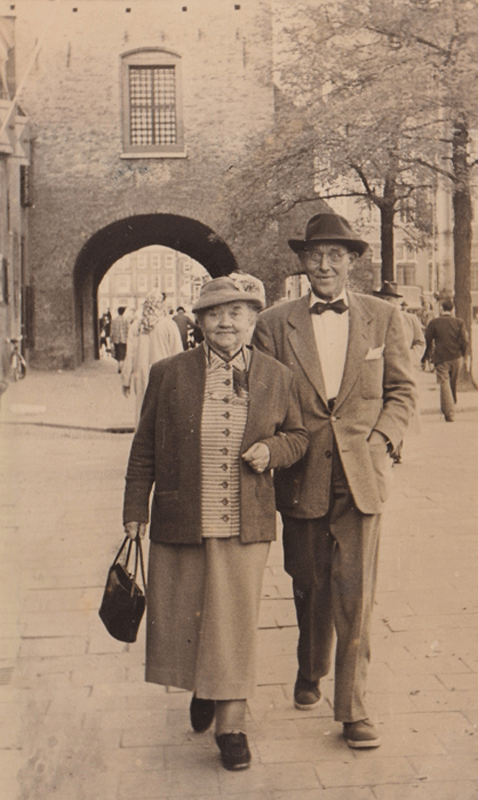 Berendina and her brother Leo Hubscher in front of the Gevangenpoort on the Buitenhof, The Hague, c. 1960.